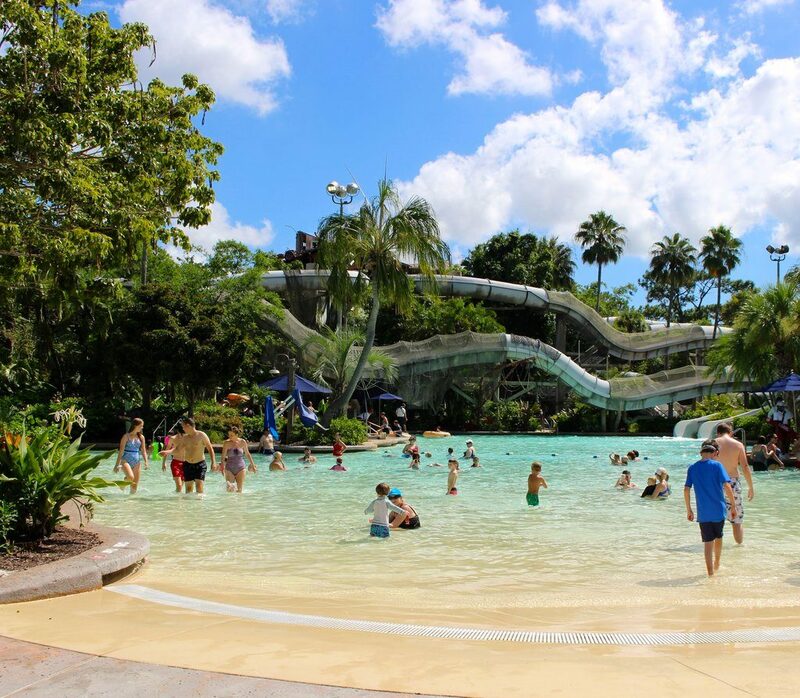 If summer is the best time for your family to travel to Walt Disney World, then consider adding a water park visit to your plans. Disney has two great options. 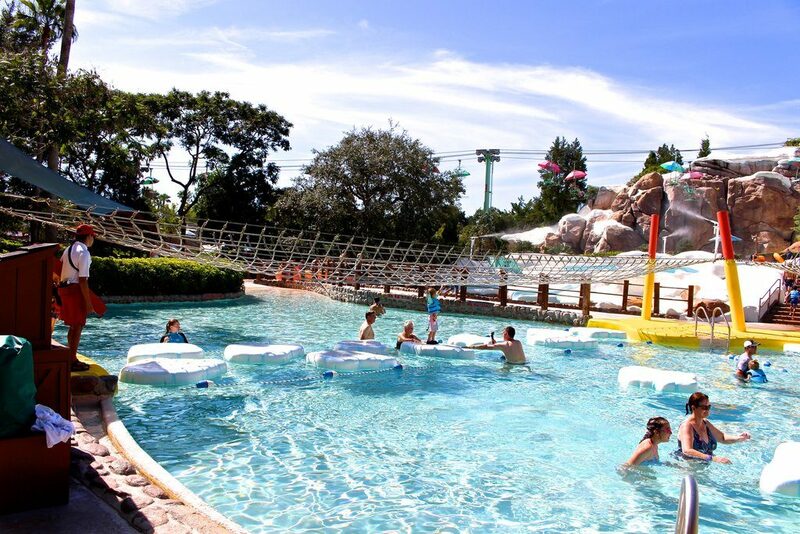 First, let me tell you about each water park, and then I’ll share with you the pros and cons of each so you can decide which one you’d like to try first. Because let’s face it, you’re going to want to visit both! 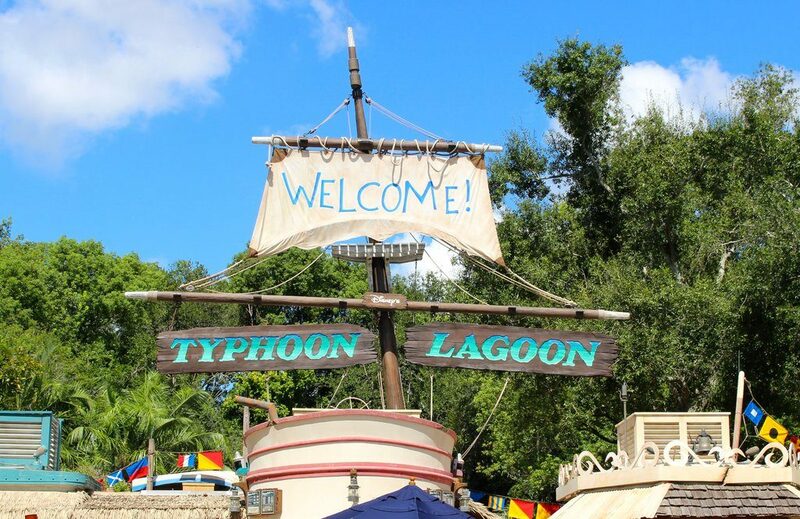 Let’s start with Typhoon Lagoon. It’s a 61-acre water park that opened in June of 1989. 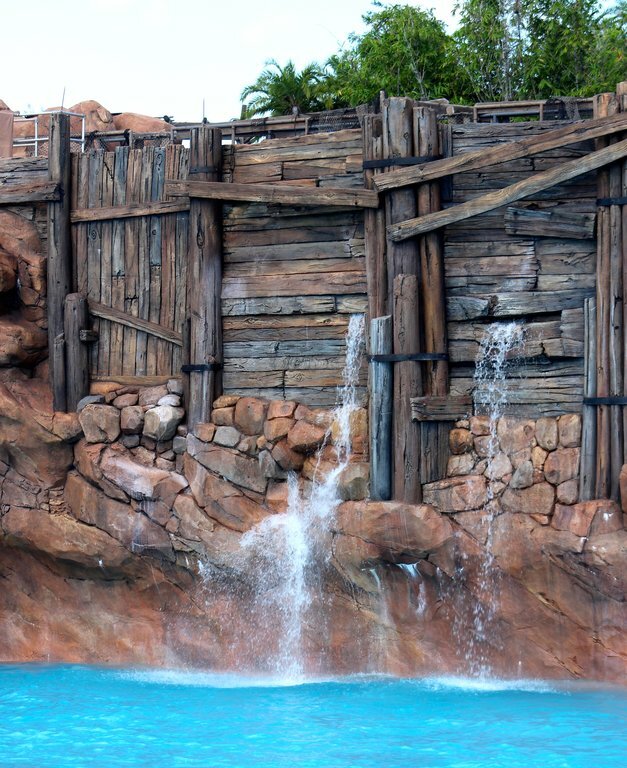 Typhoon Lagoon’s backstory is pretty simple. A giant typhoon hits a fictional town leaving it in ruins. A shrimp boat named Miss Tilly (stranded atop Mt. Mayday) serves as the water park’s icon. 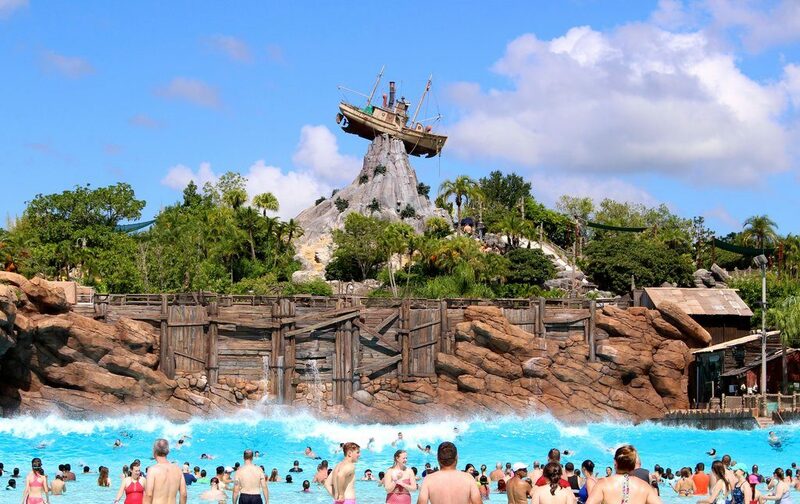 Typhoon Lagoon is located near Disney Springs. The closest resorts are the Old Key West Resort, Port Orleans French Quarter and Riverside resorts, Saratoga Springs Resort, and Caribbean Beach Resort. Evidence of the typhoon’s destruction. 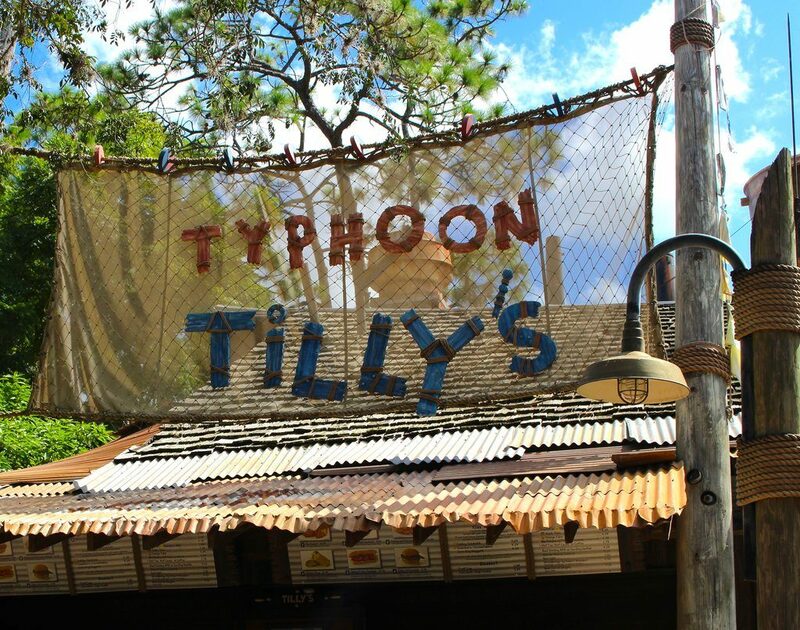 The centerpiece of Typhoon Lagoon is the Miss Tilly shrimp boat. 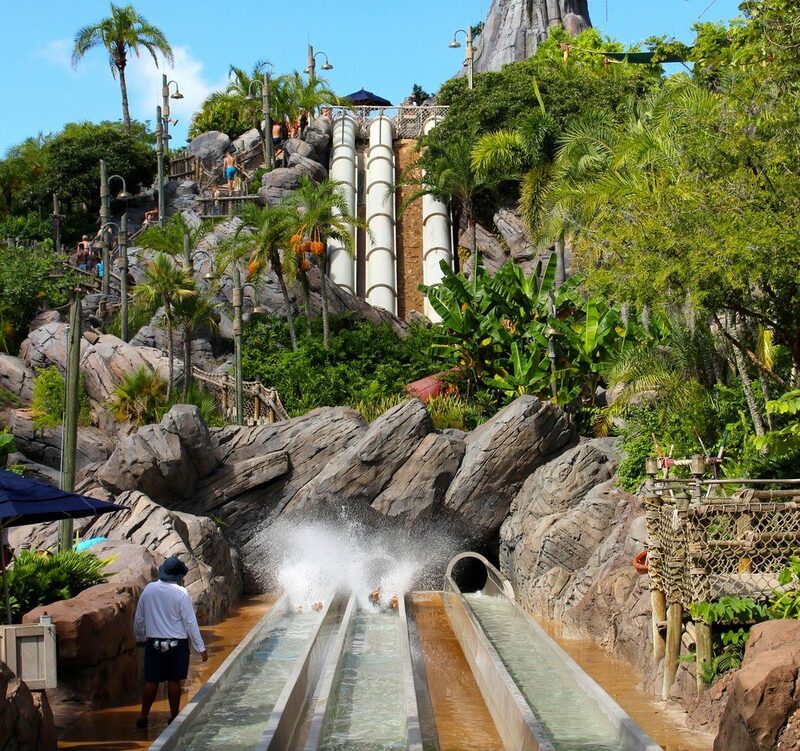 Typhoon Lagoon has 12 attractions. The Surf Pool is the dominant feature. It’s North America’s largest wave pool and when you’re in it, three different things can happen. Sometimes it’s calm, sometimes it’s a constant bobbing of waves, and sometimes a giant 6-foot wave comes crashing down on you. There is nothing more heart-stopping than the distinct “whoosh” you hear before the big wave emerges. This rickety wall is all that protects guests from an avalanche of water. The six-foot wave that gushes in periodically will knock you off your feet if you’re not careful. Your best bet is to stand chest deep and dive under to avoid it’s wrath or stand knee deep and dig in. 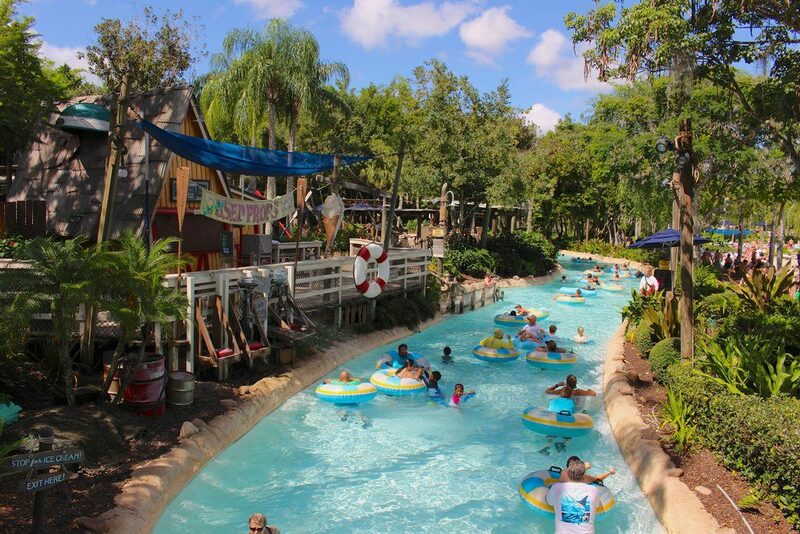 Castaway Creek is the park’s relaxing lazy river. 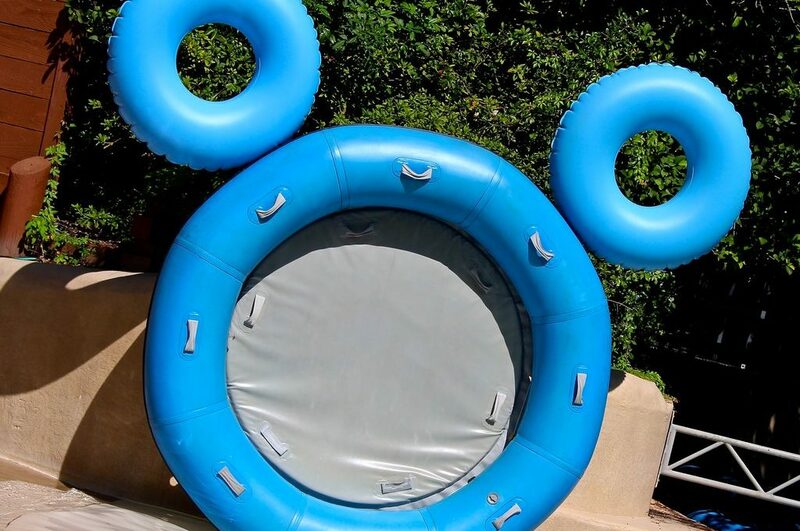 Guests can float the entire circumference of the park in a float built for one or two. 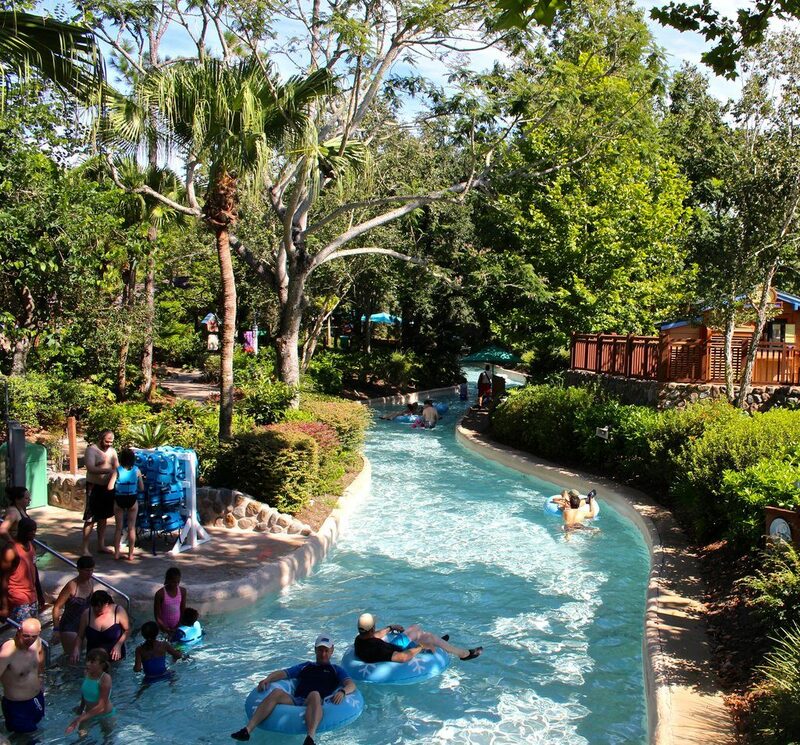 The lazy river can take you to other areas of the water park, or you can choose a round trip. It takes about 20-30 minutes to get around. There are also many water slides: Keelhaul Falls (a single-rider tube slide), Mayday Falls (a single-rider tube slide), Gangplank Falls (a four-person tube ride), Humunga Kowabunga (a five-story body slide), the Storm Slides (a trio of body slides), Miss Adventure Falls (a family raft ride), and the three Crush ‘n’ Gusher slides (multi-passenger raft rides). The Humunga Kowabunga slides travel 214 feet down five stories at a 60 degree angle. This thrill is reserved for those 48 inches and taller. Miss Adventure Falls is a family attraction, and the best part is that you don’t have to scale a mountain of stairs to ride it. Guests enter the raft at the bottom of the hill and a conveyor belt brings riders to the top. The Crush ‘n’ Gusher (48″ height requirement) slides empty out into the zero-depth pool. The park has a kiddie area for those 48 inches and UNDER called Ketchakiddee Creek. 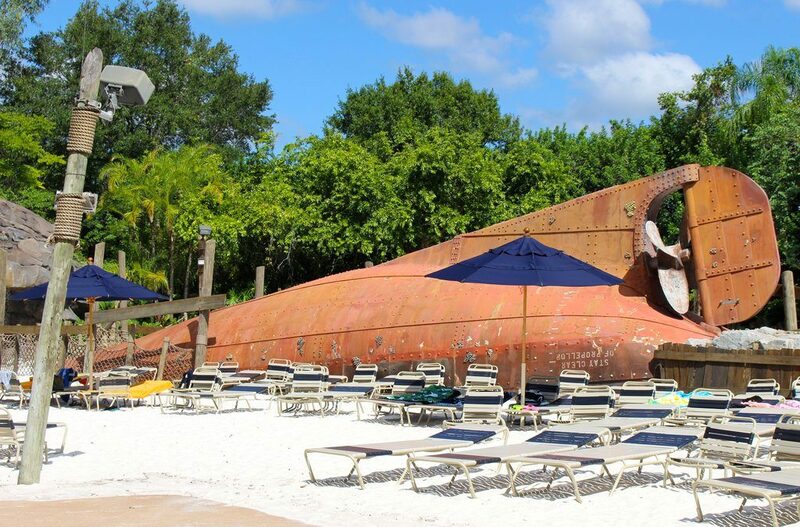 It has smaller slides, raft rides, and jets for kids to play in. The Bay Slides are a children’s version of the Storm Slides. The 12th attraction is the Mountain Trail, which is more of a walking path around the park than an attraction. For food, there are several options—all quick service. The Leaning Palms serves American fare; Happy Landings offers ice cream; Lowtide Lou’s has cold sandwiches and a bar; Hammer Head Fred’s Dive is a seasonally open bar; Typhoon Tilly’s offers shrimp, chicken, and pork and the Snack Shack right next to it has some good sandwich options; Let’s Go Slurpin’ and High ‘N’ Dry are two more bars; Surf Doggies serves hot dogs and snacks; and Tropical Amity Outpost doles out beer, hot dogs and nachos. 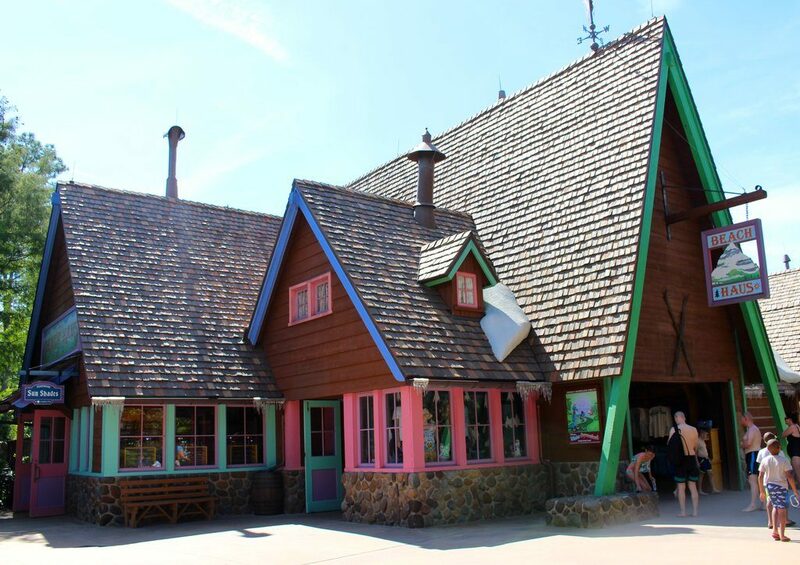 There is also an unnamed leaning shack that serves warm mini-donuts, a super popular treat. Between Typhoon Tilly’s and the Snack Shack next door, kids and grownups can walk away with a lunch they like. 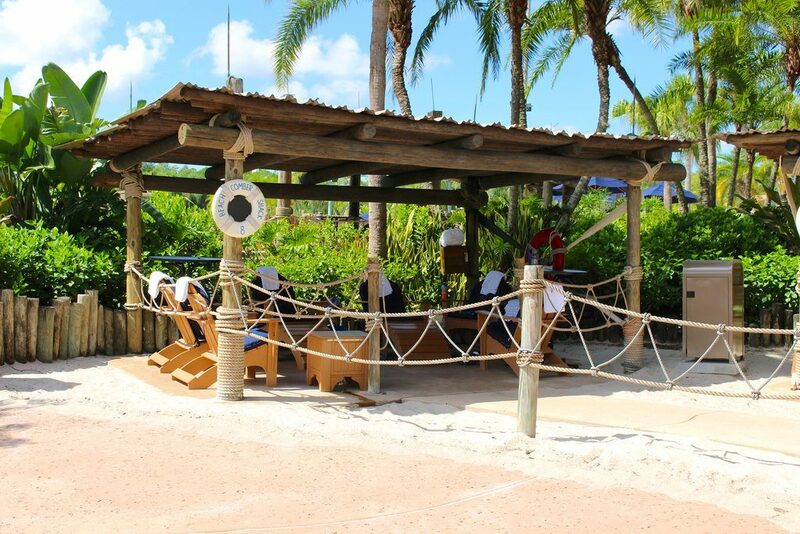 A team tip is to take advantage of the shaded seating area at this location. It’s much more comfortable to eat at the tables than back at your lounge chairs. Disney’s other water park is Blizzard Beach. Blizzard Beach opened in April of 1995 and is 66 acres. This water park’s theme is that of a ski resort in the process of a major melt. The décor is a scattering of skis and snowmen left at the foot of a melting Mount Gushmore. If you listen, you can hear a combination of beach and Christmas music playing in the background. 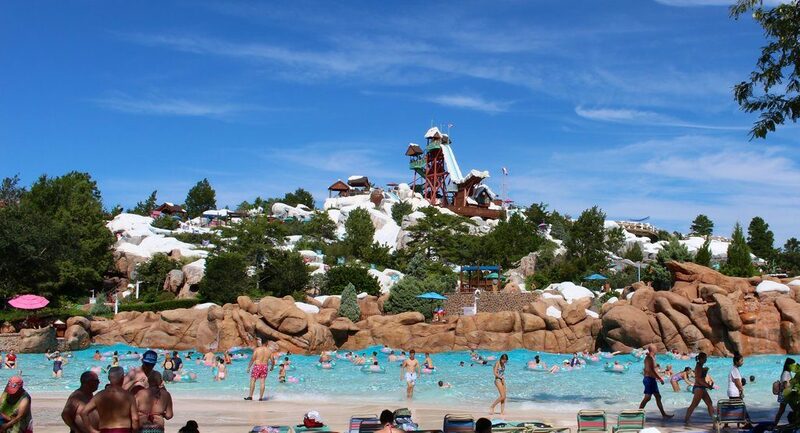 Blizzard Beach is situated between Animal Kingdom and Hollywood Studios. 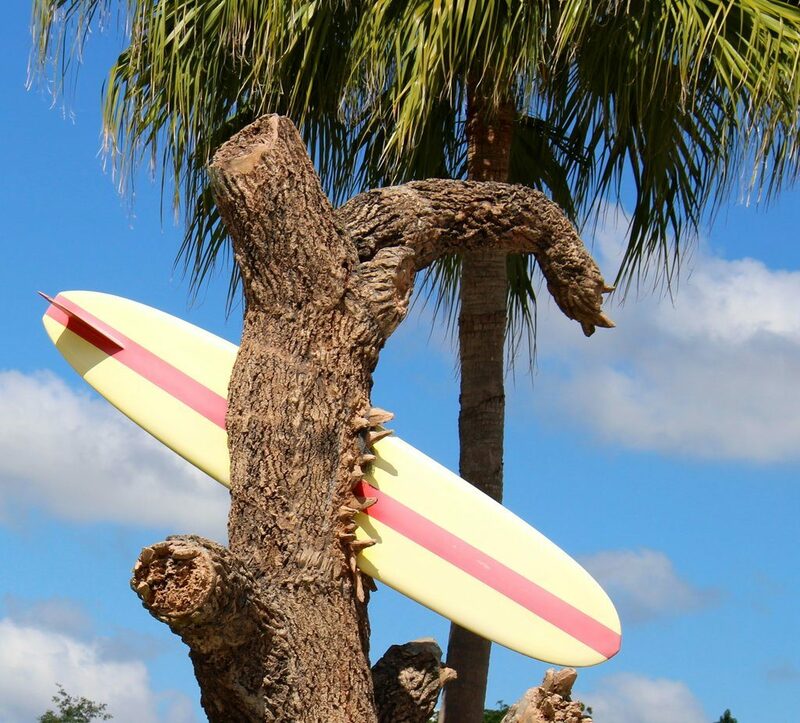 The closet resorts are the Coronado Springs Resort and the three All-Star Resorts. You can cuddle right up to Button for a photo op. 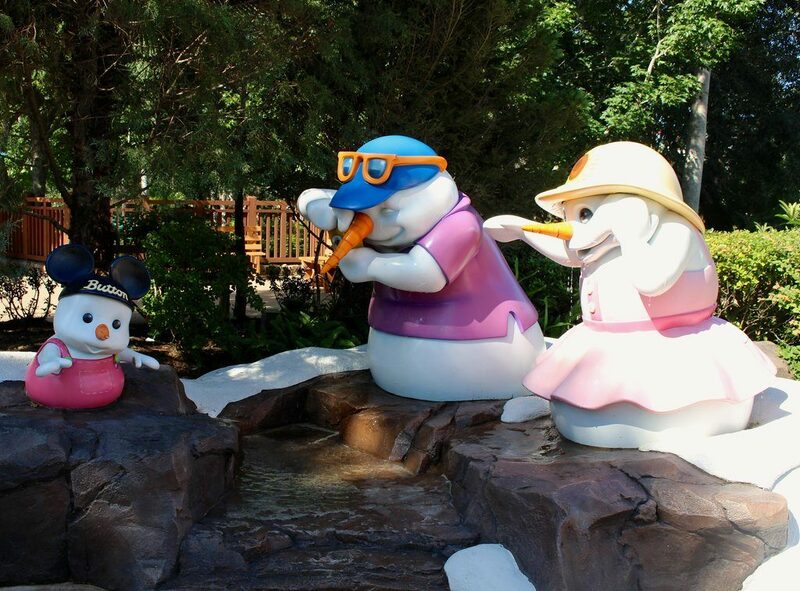 Blizzard Beach has a lot of unique theming and all the fake snow can actually trick you into feeling a little cooler. 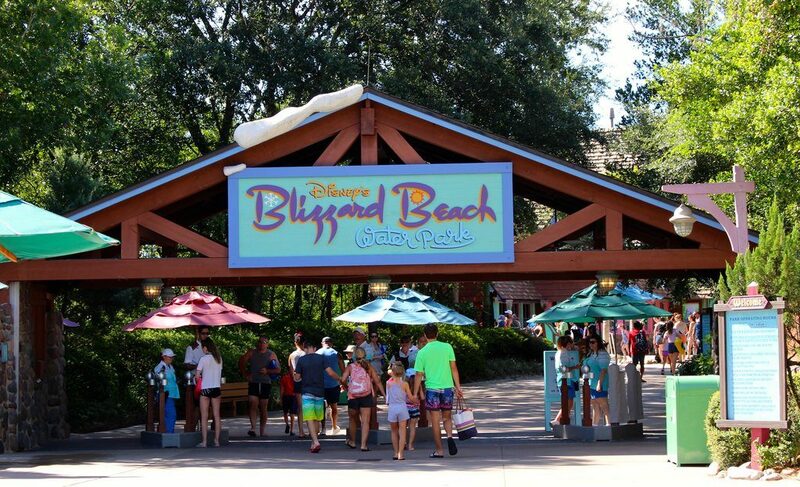 Blizzard Beach also has 12 attractions. Melt-Away Bay is the wave pool. 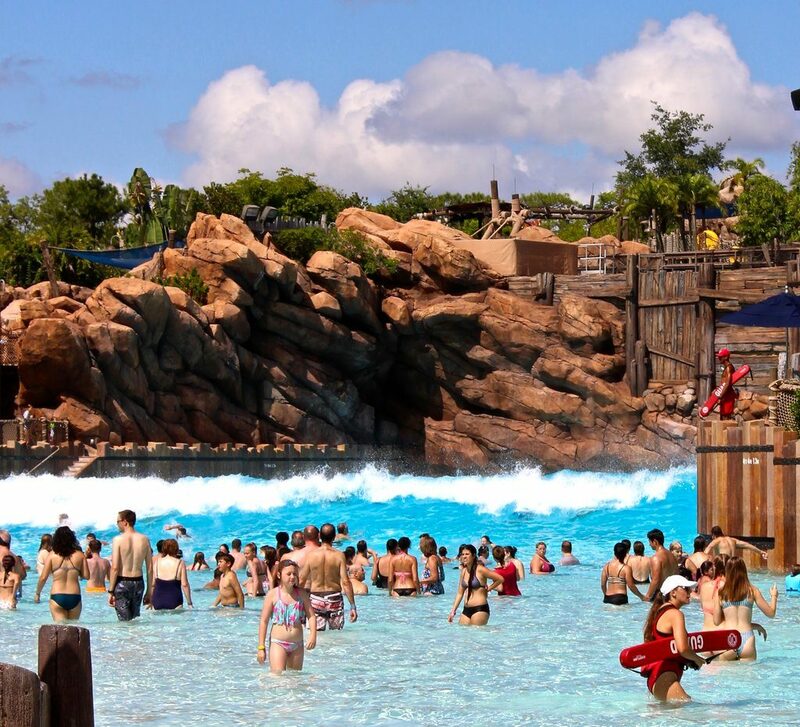 It is much smaller than Typhoon Lagoon’s and only features constant wave action, not a big wave. Mount Gushmore is home to one of the world’s fastest and tallest waterslides. The wave pool below is a great place to relax. Disney even provides the floats. Cross Country Creek is the relaxing lazy river tube ride. My favorite part of this lazy river is passing through the mountain cave as icy water drips from the ceiling. Cross Country Creek is a 3,000-foot lazy river around the park. It features a polar cave, a sneezing gator, and a melted snow waterfall. Slides are divided into the Green Slopes, the Purple Slopes, and the Red Slopes. The Green Slopes are great because you can reach them all by an enchanting pastel chairlift (although stair access is available, too). Once up top, you have three choices to get down. 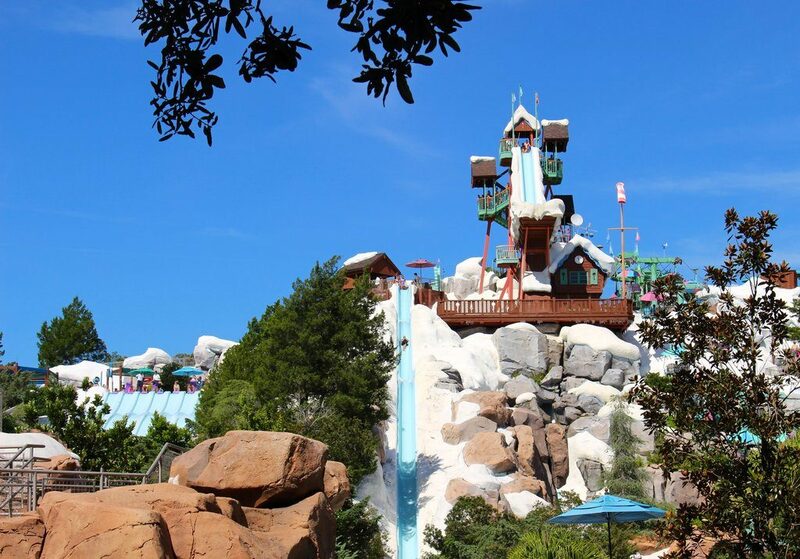 Summit Plummet and Slush Gusher are two thrill slides that require riders to be at least 48-inches tall (and willing to endure a bathing suit wedgie). 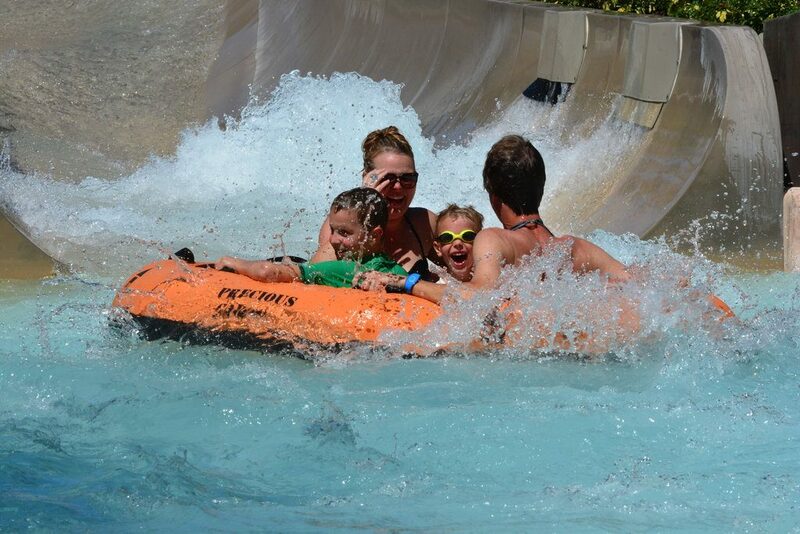 The third choice is Teamboat Springs, a family raft ride that fits up to six people. If this is your first visit to a water park and you’re not sure if your kid will like water slides, this is a good first option to try. It’s a pretty mild ride and they can snuggle up to you the whole way down. Pictured here are the Toboggan Racers (far left), Slush Gusher (middle), and Summit Plummet (right). The chairlift will get you to the latter two, but you’ll have to hike several flights of hot stairs to reach the racers. The Purple Slopes feature the Toboggan Racers (a single-rider mat slide), the Snow Stormers (a single rider mat slide) and the Downhill Double Dipper (a tube slide). The Downhill Double Dipper is a 50-foot race down a tunnel. It does have a 48-inch height requirement. 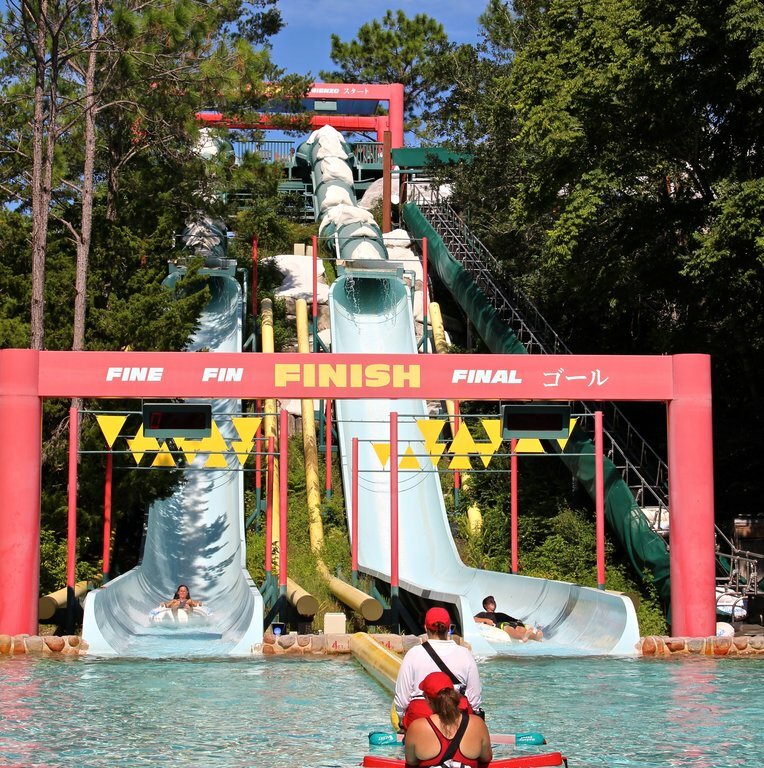 The Red Slopes feature Runoff Rapids, an inner tube run where guests can choose to careen down one of three different flumes (one in the dark). The children areas are Tike’s Peak and the Ski Patrol Training Camp. The Training Camp is a major fun spot with a zip line, icebergs, and slides. “The area is challenging, not babyish,” says Kirk, our veteran team member. 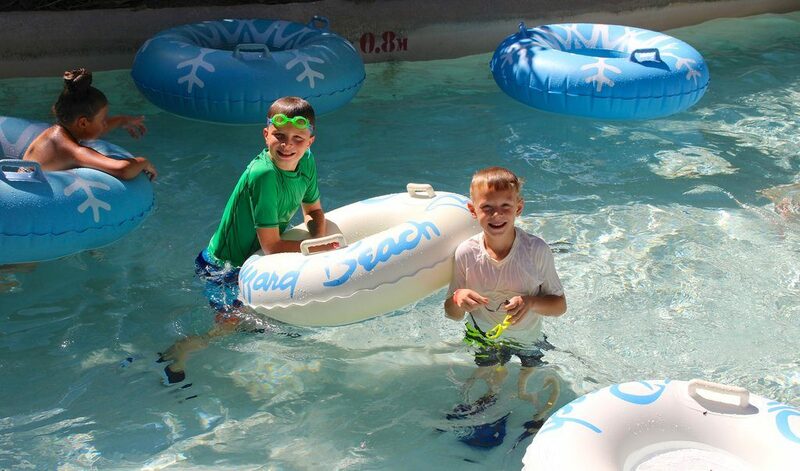 Ski Patrol Training Camp is the best kids pool area EVER! I love it when the lifeguards whistle at the grownups to “get off the icebergs.” Kids rule here. Hungry? Lottawatta Lodge is the main dining location and features American fare, flatbreads, and rice bowls. The Cooling Hut is a quick spot for sandwiches and snacks; Frostbite Freddy’s has ice cream, turkey legs, and frozen and adult beverages; Arctic Expeditions and Polar Pub are both bars; Avalunch (my favorite name) offers hot dogs and salads; I.C. 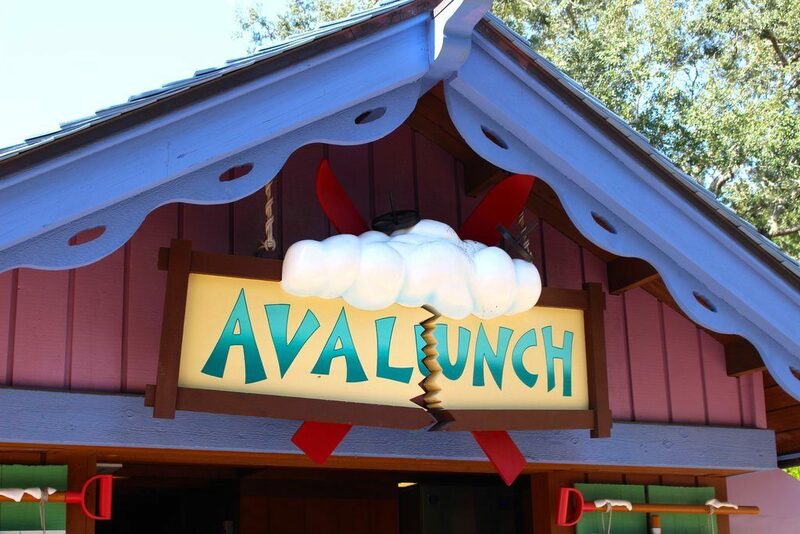 Expeditions serves ice cream treats; and the Warming Hut has soup, salads, and sandwiches. 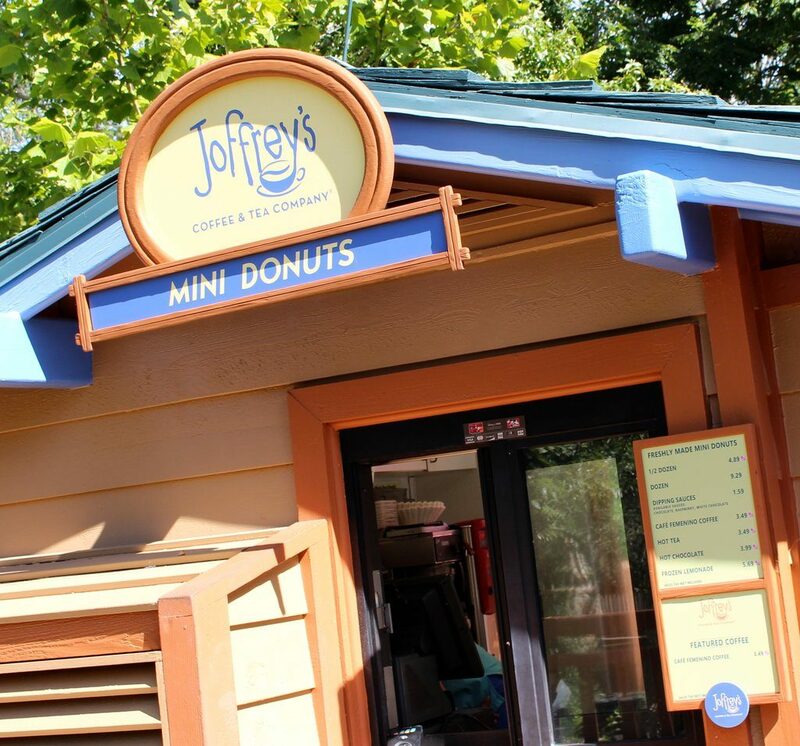 There’s a mini donut shop, too. 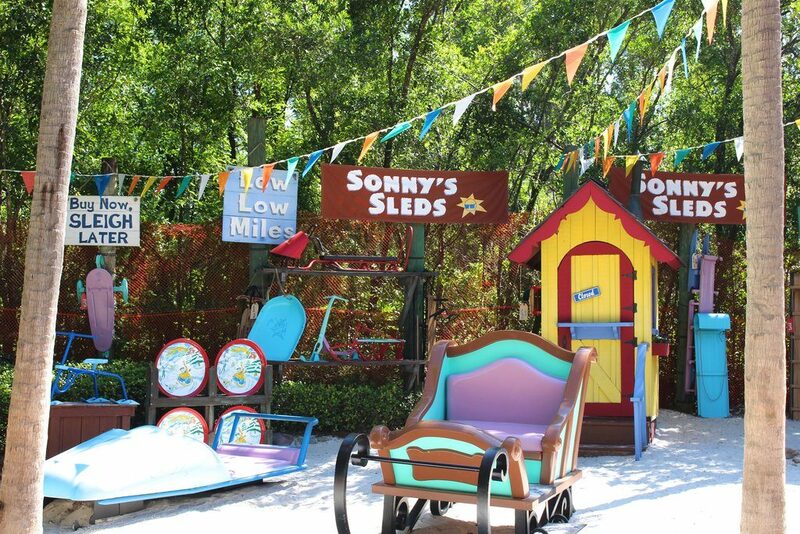 The play-on-words at Blizzard Beach is really cute. However, I noticed most families brought their own cooler lunches. Disney is totally fine with that. All the lounge chairs around the wave pool fill up immediately. This rare shady spot was the first to go. If you’re a sun worshipper, spots in the blazing sun are easy to find. 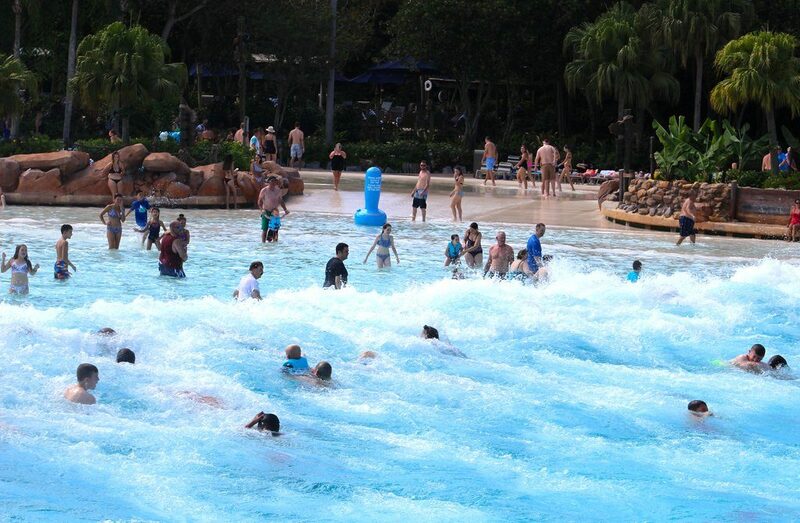 Be really, really careful at the wave pool. The bottom of the pool is like sandpaper. If a wave knocks you over, you could very easily end up with a nasty scrape. Kids also get swept away pretty easily. The wave can pull them right out of your arms. Proceed with extreme caution in this pool. The chairs hold up to three people. The lift is not just a convenient way to get to the top of the Green Slopes, it gives guests a fantastic bird’s-eye view. I wish round trips were allowed. 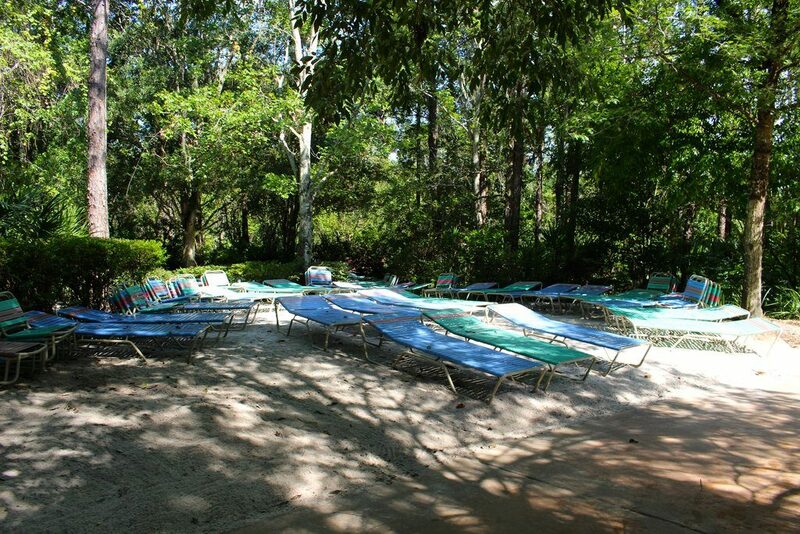 There is tons of shade to be found at Blizzard Beach. Behind the mountain are loads of lounge chairs in the woods. It’s a great place to set up camp for the day and keep the family cool and sunburn-free. -If you have room in your suitcase, bring a a couple of colorful beach towels from home to mark your spot. White towels are free for resort guests with a magic band but it’s so much easier to find your location when you have your own towel to look for. 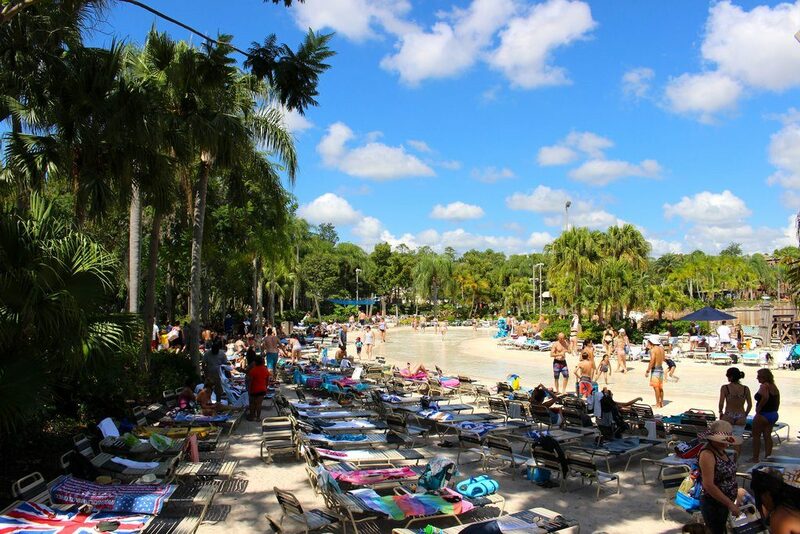 Non-resort guests must bring their own towels or rent them for $2 each. -Visit on a weekday if you can. It’s easier to find lounge chairs, and the wait times are much shorter. On a weekday, the lazy river was practically empty. 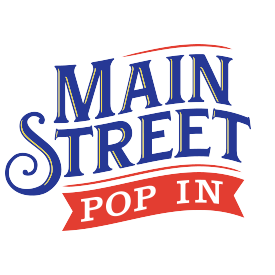 -Bring $10 or $15 in cash or a credit card if you want to quickly rent a locker. You can charge your locker to a Magic Band or gift card, but you’ll have to wait in line to get a code. 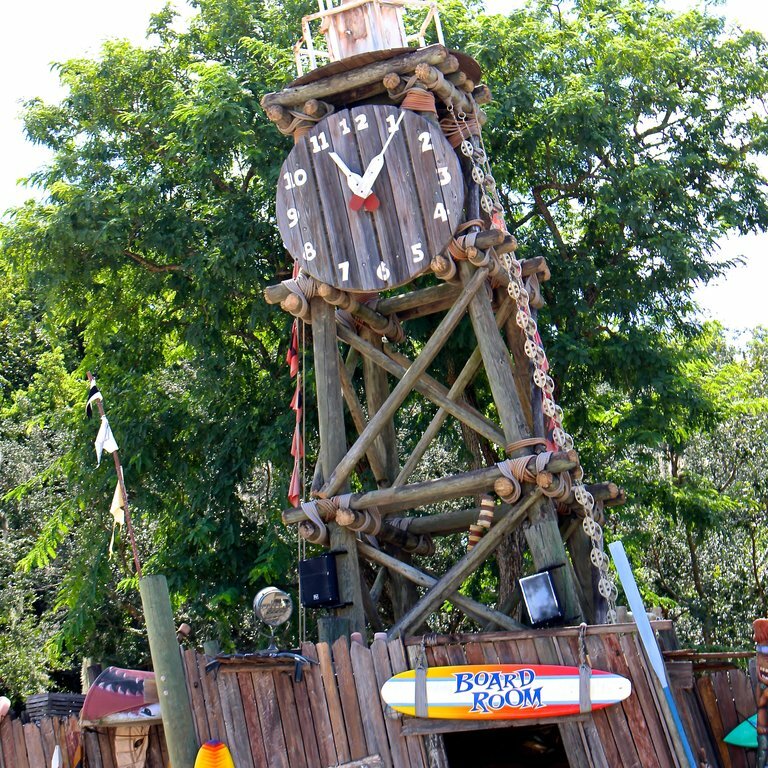 -At Typhoon Lagoon, you don’t need a watch or phone. There’s a giant clock to help you keep the time. I love this clock positioned right in the center of the action. I didn’t need a phone or a watch all day, which means I never had to worry about it being lost, stolen, or dropped in the water or sand. -Consider renting an umbrella and chairs (especially if you are visiting on a weekend). For about $60, you get two big lounge chairs, two small chairs, a side table and an umbrella in a designated area. If you plan to stay all day, you’ll want a place with shade and a little quiet in case you want to read or take a nap. For about $60 we had these chairs, table, and umbrella reserved in our own private spot. If you want luxury and your own personal attendant the Beachcomber Shacks cost about $350 and come with a personal locker, water and ice, refillable mugs and more. 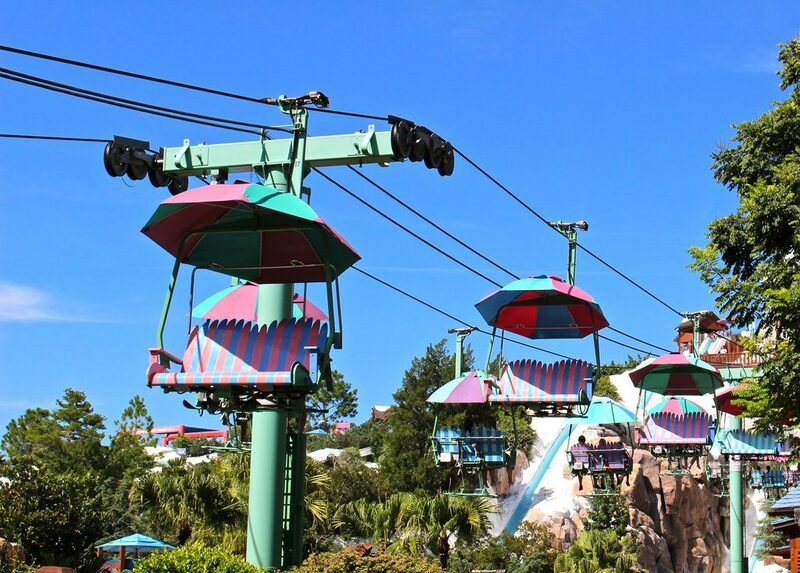 -Using Disney bus transportation to reach the waterparks can be a hassle. If you have a rental car, use it instead. 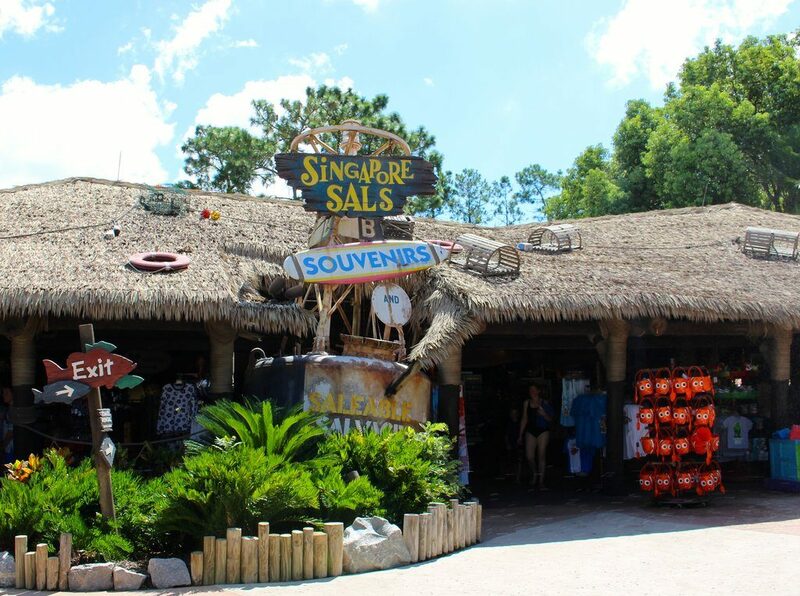 Singapore Sals at Typhoon Lagoon is a small gift shop and the location to pick up towels. They’re free to resort guests with a valid magic band. 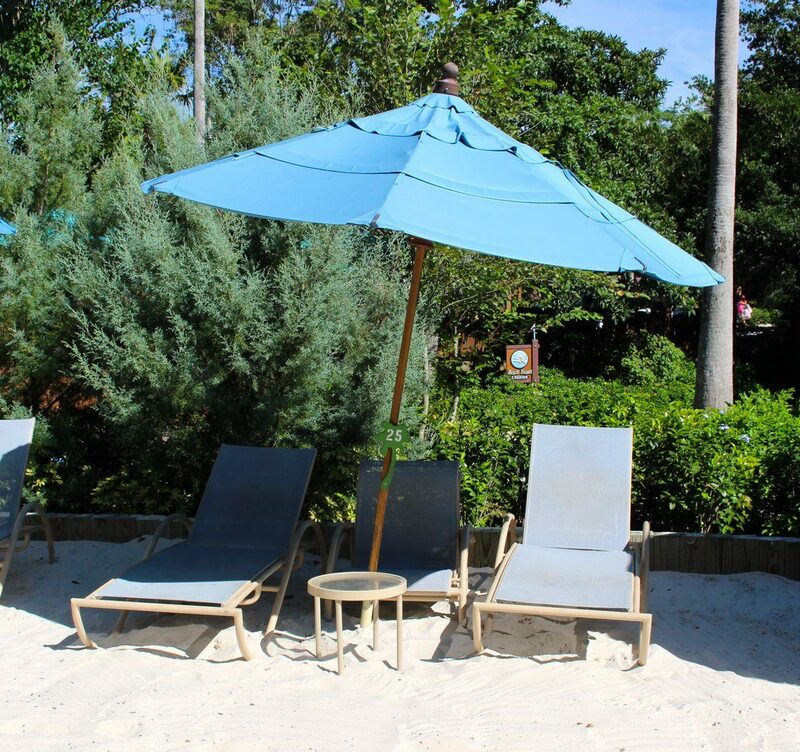 The Beach Haus is the place to get towels and rentals at Blizzard Beach. It has sunscreen and other forgotten essentials as well. Water park tickets cost $65 for those 10 and up, and $59 for those 3-9. An annual pass for the water parks is $130. Parking is included and free busing for Disney resort guests is available. So which park do you like more? Let us know in the comments below.